For the last century the length of the Amazon and the Nile Rivers have been in a tight battle for title of world's longest river. The exact length of the two rivers varies over time and reputable sources disagree as to their actual length. The Nile River in Africa is reported to be anywhere from at 5,499km/3,437mi to 6,690km/4,180mi long. But there is no question as to which of the two great rivers carries the greater volume of water - the Amazon River. 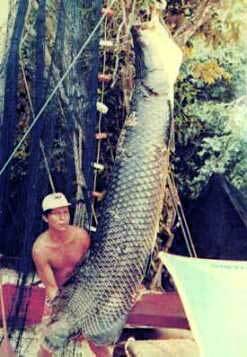 How did the Amazon get to be so big? The first reason has to do with its location - right at the equator. Around the "belt line" of the earth lies a warm, tropical zone where over 400 in/1016cm of rain fall every year. That averages out to more than an inch (3cm) of rain, everyday! 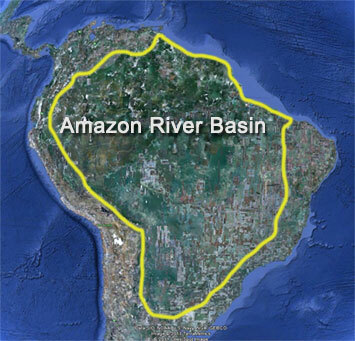 A lot of water falls onto the land surrounding the river, what is called the "Amazon River drainage basin". A good way to understand what a drainage basin is to think of the whole northern half of the continent of South America as a shallow dish, or saucer. Whenever rain falls and lands anywhere in the river basin it all runs into the lowest place in the pan, which happens to be the Amazon River. The sheer volume of rain in the Amazon jungle, as well as the slope of the surrounding land, combine to create the enormous river known as the Amazon.